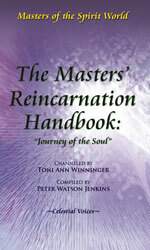 This is the only book you simply must have to understand the idea of reincarnation. The book’s authors are a group of senior guides who live on the Other Side. They know all about our life here on Earth and explain in detail how, as eternal souls, we choose a series of human lives to learn lessons and to gather knowledge. This leads to growth in wisdom and maturity. The Masters’ teaching about the journey of the soul has been translated by leading clear channel Toni Ann Winninger, whom they have chosen to be their voice for this important spiritual publication. The pamphlet is free from this site in a pdf format. It is available in a number of languages and we are continually working to add more translations.